The film then goes into flashback, focusing on the young man, a teenager, Keda (an impressive performance and screen presence by Australian Kodi Smit- Mc Phee). There are initiation rituals, some young men failing, others sharpening spearheads showing their priowess and for future use. 1. Imagining prehistory? Speculating about human nature, human behaviour? Evolution? 2. The recreation of the landscapes of Europe, 20,000 years ago, the mountains, cliffs, rivers, the seasons and snow and ice? The musical score? 3. The humans (and their resemblance to 21st-century humans)? Appearance, the men and the women, teenagers? Warriors and hunters? Family bonds? Clothes, weapons? Caves, fears? The respect for ancestors, the spirits? 4. The opening hunt, the bison, the attack, the men crawling, the panic of the beasts, the raid, the animals going over the cliffs, Keda and the attack, his being tossed over the cliff? On the ledge, survival? The hunters and their collecting of meat for the winter season? 5. Keda, his age, the initiation, the quality of the knife, his father presiding, the fight and the bashing of the initiates? His listening to his parents’ comment about him, his mother saying he led with his heart rather than the spear? Admiring his father? Participating in the hunt, attacked by the animal, his father spearing the animal, his being tossed? The vulture and his confrontation? Climbing down the cliff, the rain, falling into the water, left? His injuries and his treatment of his leg? 6. As a survivor, water, food and worms, the poultices for his leg, the attack of the wolves, hiding the tree, the wolf being wounded, his concern? 7. The caves, the wolf and its injury, the bond, giving the water, tending the wound, killing the rabbit, sharing the food, the efforts to make fire after his initial failures? The wolf snarling, but changing in trust? 8. The travelling of the landscapes, sharing, the coming of the winter, ice and snow, the man frozen. Keda going beneath the ice, the rescue? The arrival of the other wolves, Keda letting Alpha go for the family? 9. Human/canine relationships? The bonds? 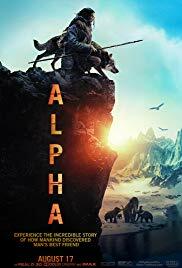 The naming of the wolf Alpha? 10. The effect on Keda, his father saying had more strength than he knew, the encounter with the frozen man in his tent, the beast in the cave and the fight, Alpha wounded again? His carrying Alpha? Seeing the snow-covered cairns? The stars on the map on his hand? 11. The camp, arrival, collapse, the welcome, reunited with mother and father, caring for Alpha? The surprise birth of the cub? 12. The tribe, the number of wolves, humans and walls bonding? A stage in evolution?